On Sunday 2nd December and Friday 7th December 2012 Enter CIC students put on their Victorian costumes and headed off to Beamish Museum where they performed traditional carols in the Chapel and the Masonic Hall. The children performed classic carols such as ‘Away in a Manger’, ‘Oh Come all ye Faithful’, ‘O Holy Night’ and the Christmas hit ‘We Wish you a Merry Christmas’. Despite the winter weather our young people took to the streets of Beamish and sang We Wish you a Merry Christmas to passers by outside the Barclays Bank (picture left). 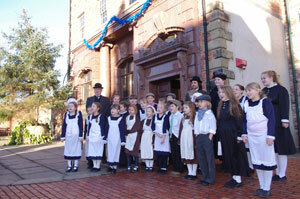 The children performed in the Masonic Hall and twice in the Pit Chapel. Members of the public were amazed by the quality of our young people performing, many of them stopping to congratulate the children on their way out at the end. It was fantastic to see over 100 people turn up and fill the Chapel as they heard our young people singing from outside. We know that staff at Beamish were very impressed with the conduct of our young people and the performances they produced. The children were fantastic representatives for Enter CIC. We work hard to continue creating educational and aspirational opportunities for all of our young people. We have built a fantastic relationship with Beamish Museum in the last year. For all of our events where transport is an issue we try to provide low cost or free transport to and from venues. For this event we managed to secure free transport for parents to travel to Beamish from Ferryhill and each child received two free tickets for their parents to gain free access to the events. “It was great to have Enter CIC at our Christmas Evening event, the young performers are so talented and were an absolute joy to work with – I have never seen our Chapel so full! It is not only me that thinks you were exceptional but also members of staff and public. A member of public stated on our Facebook page on Friday 7th December that ‘the singers in the Pit Chapel were great’; on leaving the Chapel on Friday evening, a member of the public told me that the children had made ‘the hairs on the back of my neck stand up’.